I love how the white background makes all the fun colors pop! She keeps most of her materials in boxes, I love having a basket on the worktable (and a clear worktable at that! Lots of sun peekeing trough the window too. There was something on that show Whoopi is on the other day about a new phenomenon called the "Woman's Cave" or something like that. 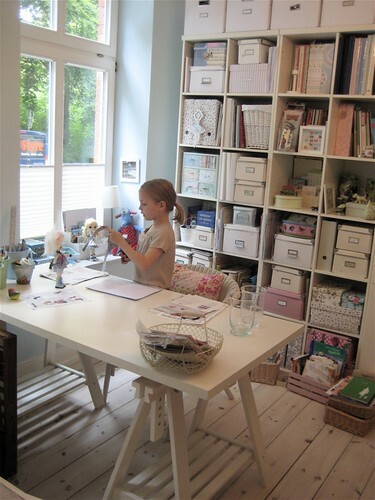 I thought "where have you been, women have needed sewing rooms since time begun ..."
Wow, that's a beautiful room. I thought I was being all creative when I put some Rubbermaid tote boxes in my closet!! I'd love to know who builds these for you ? 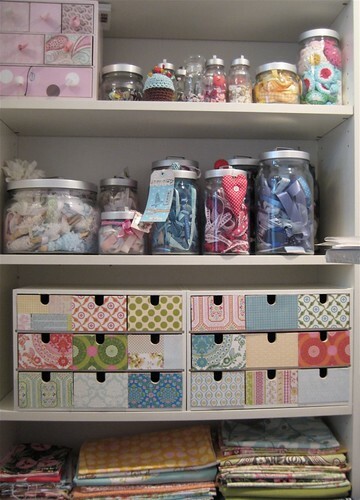 Great job organizing your craft room! It looks amazing! Hi Ladies, Im not the owner of the room (That would be Moline, if you follow the Flikr link, you might be able to leave her a message on the original pics) meantime I might have some of the answers for you. DESK: I have the same legs, by Ikea, diferent top, mine is 60"w x 27"d so I guess this one is about that size I think its called trestle on the IKEA catalog. CUBBIES: I guess that's what you are referring as to who builds these, some look like expedits, but others with adjustable shelves are not, I wonder if they are from the closset line at IKEA or something completely different. Hi there! Just found me here. The storage is from IKEA. it was called Bonde but they don't do it any more. And the wooden storage with the paper scraps at the front are simple IKEA drawers I just covered up - se, no miracle and not expensive!